Thomas joined the British Army, and after spending 25 years as a soldier, he received a government pension. 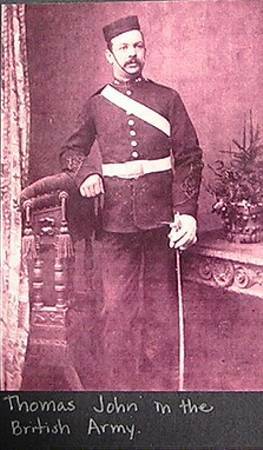 He spent time in England, India, and later fought in the Boer War in South Africa. It was reported that, during this war, he once saw young Winston Churchill come out of the bushes wearing only a sack cloth around his middle. No doubt, Churchill had been captured by the Boers. When he retired from the military, he went home to England, but he found it uninteresting, so he followed his family to Sherbrooke, Quebec. At the address he had, he found that the house had been demolished and replaced by a school. Not knowing what else to do, he went to the cemetery, and found his mother's grave. While there, Persena came by, and he reestablished contact with the family. He learned from her that his brother had been injured in a mine accident. He went to his brother, and found that the brother was dying. He then cared for his brother's family until the children left home and his sister-in-law died.